UPDATE: MANY THANKS TO ALL IN THE C4A COMMUNITY WHO DONATED TO THE DAGBE CENTER. THE CAMPAIGN HAS REACHED ITS GOAL OF PROVIDING A YEAR OF SUPPORT TO THIS EXTRAORDINARY MUSIC SCHOOL!!! 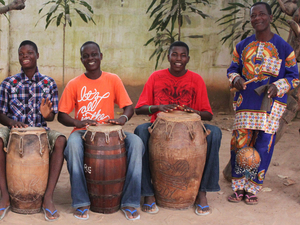 In December of 2014 the C4A board of directors voted to form a sister organization relationship with the Dagbe Cultural Institute & Arts Centre, a community music school located in the village of Kopeyia in Ghana. The Dagbe Centre is a community music and dance school in Kopeyia, Ghana, devoted to preserving the extraordinary musical traditions of the Ewe people that populate that region of Ghana, as well as parts of Togo and Benin. 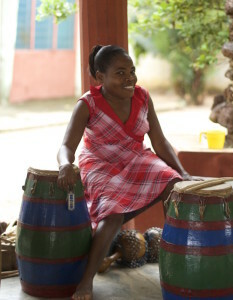 Dagbe enjoys an international reputation out of proportion with its small size: in addition to being an invaluable resource for West Africa, Western musicians and scholars travel regularly to Dagbe to learn ways to incorporate Ewe rhythmic sophistication into their own playing. Since it’s founding in 1984 the Dagbe Institute has been supported though specialized cultural tourism programs that cater to Western musicians and scholars. Unfortunately, the recent Ebola horror in West Africa has brought a virtual halt to non-essential Western travel to the region. Ebola has not spread to Ghana, however the music and culture tours that have sustained Dagbe since its founding have stopped. We’ll have more news for you as this relationship develops. In the meantime you may read more about it in this PDF document. Please feel free to share this letter with anyone you think may find it interesting.